What could I expect from a Sunday morning service at the North Unitarian Universalist Congregation? OK, but what do I wear, and how do I behave? Is Unitarian Universalism a Christian faith? So what do Unitarian Universalists believe? What does membership in a Unitarian Universalist Church entail? Why did the Dublin Unitarian Universalist Church change its name to the North Unitarian Universalist Congregation? Our services open with those things that remind us of the importance of gathering together. We hear the call to worship that invites us to transition from our everyday concerns and into our time together. During this first part of the service we also sing a gathering hymn, and share in a moment of silent meditation. We recite our covenant together, a reminder that even though we have no creed, we are bound together by the obligation to assist each other in our spiritual journeys and to understand how might helpfully relate to the world at large. The second part of the service is for reflection. We hear a teaching story from religious tradition, enjoy a musical interlude together (often performed by our choir), and hear a reading. We draw on a huge variety of sources for these inspirational moments–from scripture (from a variety of world religious traditions)–to contemporary poetry. We then listen to a sermon. The sermon is given great emphasis within Unitarian Universalist worship services. Our sermons are never chastising, punishing or irrelevant; rather they are aimed at understanding how we, as people of conscience, might lead better, fuller lives today. The third part of the service celebrates and reaffirms our community. We collect an offering, and hear announcements about the business and activities of our congregation. We then take the time for anyone who would like to share some important event in their life–either a joy or a concern–to do so. We also sing hymns together–from the traditional to the very modern. The reflective and meditative tone for worship is then set by readings, responsive readings, and music. The service closes with a hymn and closing words, or a benediction, which is intended to send us back into our lives with a renewed sense of purpose. But there is no reason to run away after worship is over. Many will tell you that the after-church coffee, where we share the week’s events with friends new and old, is just as if not more important than the service itself. Our services are generally led by our minister. Yet once a month lay persons lead the service, an important reminder of our tradition’s insistence that all persons have important truths and experiences that can profitably shared with others. Not to worry. You will find us a friendly and casual group, eager to help you feel at home. Our members wear everything from Sunday best to casual jeans to our services, so wear what makes you most comfortable. Our historical roots are within Christianity. Indeed, there have been Unitarians and Universalists as long as there have been Christians. In the 19th century, both Unitarians and Universalists chose to hold their faiths open not only to the teachings of Christianity, but also to other world religious (and secular) teachings. Consequently our congregations today include both people who would identify themselves as Christians and those who would not. Because we have always emphasized that adherence to the ethical teachings of Jesus is much more important than the actual worship of Jesus the person, we have also historically attracted a fair number of people of Jewish heritage. The Unitarian and Universalist movements merged in 1961. Click here to read about our Principles and Purposes. Since our movement is one that embraces theological diversity, there is no test of belief for membership. Membership in the church is attained by simply signing the membership book. Signing the membership book does two things. First, it expresses your interest in sharing your talents, resources and energy with our congregation. As always, the quality and quantity of that sharing is up to you. As one of our ministers, the Rev. 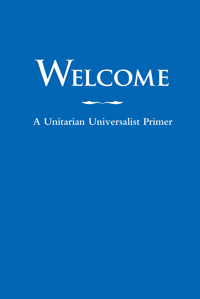 Jack Mendelsohn, put it “…in joining a Unitarian Universalist church, the initiative is entirely yours. You do not sign on someone else’s dotted line of spiritual development, and there is no fine print.” Second, signing the membership book formalizes the church’s commitment to you, and consists of our promise to value and support, within our larger community, your individual path.